Well blog posts have certainly been few and far-between the past couple of weeks. Vacation, a parental visit and a very busy time at work have also faced a lack of inspiration along with a touch of writer's block leaving this place pretty quiet. Bought a new computer this weekend after we determined that the five year-old HP PC was grinding away on its last legs, so the little bit of screen time I have had has been getting this (wonderful) beast all configured for three users. A few calls to my Apple tech support team (Rob and Dan) have helped greatly. 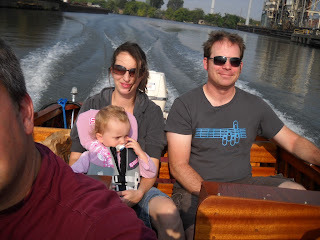 Anyway, Joe had special guests on the old boat yesterday - Bill and his family were in town from Oakland. 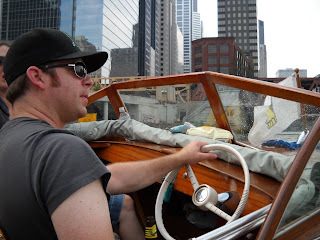 Bill's grandpa was the original owner of the mighty craft and he was able to experience an outing on it outside of its home state of Wisconsin. 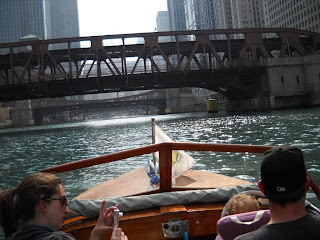 Here are some shots from their Chicago River outing on Monday. So. Very. Jealous. 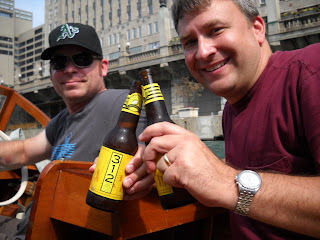 *just a wild guess, 20 years ago we chased stale Hostess powdered donettes with Leinenkugels on Green Lake. One nasty combo. Fun ride. Well, until we ventured into the wave pool that was Lake Michigan.